There are many reasons why more and more retail stores and packaging companies are opting to use hang tabs instead of bulky packaging to hang the product or not hanging it at all. Among the most notable reasons are increased cross-selling of your merchandise, increased brand awareness, increased sales through impulse purchases, reduced packaging cost, and reduced shelf space. We offer a wide variety of hang tabs that are sure to meet all of your retail display needs. Slot hang tabs are great for single or double wire pegs. They come in delta and Euro shaped holed to ensure your products will center themselves for easy loading. Hook hang tabs are perfect for products that come in different colors, because the customer can easily move around the product and see all of the varieties available. Round hole hang tabs are idea for lightweight items that are hung on one peg. Fold up hang tabs can be ordered in the hook, hole, or slot style. They can be put on pre shipping and lay flat until hung up on a peg or strip. Interior, security, and box top hang tabs will secure and seal your product’s packaging without blocking any of your branding or graphics. Reinforcer hang tabs are the perfect amount of support for less sturdy packaging that is susceptible to tearing or breaking. Heavy duty hang tabs are extremely strong and durable. They work extremely well with large, heavy, or oddly shaped products. Cylinder hang tabs were designed to hang products with rounded or curved packaging. 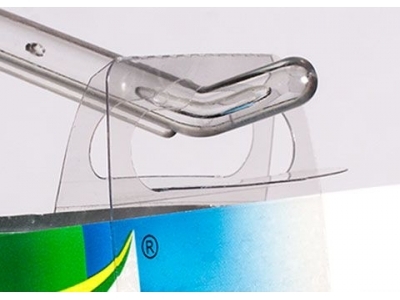 FlexiTab hang tabs have a thick hole and thin adhesive area which makes it ideal for curved, uneven, or uniquely shaped packages. At Do-It Corporation, we have been in the retail display injury since 1973. We are proud to be the largest hang tab manufacturer in the world in our industry. If you have been looking for a way to cut costs and increase sales, give us a call today!